When you lose a tooth, your quality of life and oral health significantly decline due to the empty space. Now, you have many excellent options available to replace it, but which is best? You may have heard about the benefits of dental implant placement in Piedmont, but are they right for you? At Bluff Creek Dental, we understand that you have plenty of questions about the procedure. To help you make a wise decision, we have the answers you need. 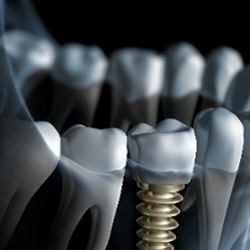 Dental implants are different than any other type of prosthetic tooth because they use implant posts, which are surgically placed into the jawbone. When a single tooth is lost, a dental implant post, an abutment, and a dental crown are used. 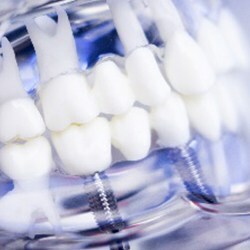 If several teeth are missing in row, a dental bridge is created, which is held in place using one or two implant posts. An entire arch can also be replaced. With implant retained dentures, the base it attached using an average of 4 implant posts. There is no set price tag for dental implants because their cost is based on your individual treatment plan. Factors that will influence the cost may include how many teeth need to be replaced, additional procedures, or your dental insurance. During your initial consultation, we will provide you with an estimate for your procedure. We also have a $2,500 implant special to help you stay within your budget. Dental implants have over a 95% 10-year success rate. With the right aftercare, like maintaining your oral hygiene and regular care from your dentist, they have the potential to last for a lifetime. You will need to have the crown replaced about every 10 years because it will experience wear and tear. You are never too old for dental implants; however, your candidacy depends on your oral and general health, as well as your jawbone’s density. Completing your smile with dental implants will take several months. After the implant placement, your jawbone will need time to heal to fuse to it, which can take several weeks. After adequate healing has occurred, the abutment and dental crown will be attached. Caring for your new smile is similar to caring for your natural teeth. Brush twice a day and floss each night while paying careful attention to clean around the implant posts. In addition, do not forget to see your dentist twice a year for a cleaning and checkup. Does Smoking Cause Implant Failure? Smoking or tobacco use in any form increases your risk for implant failure because it lowers your body’s ability to heal and fight infection. With infection the biggest threat for implant failure, it is best to avoid tobacco. Dental implants are the only tooth replacement option to preserve your jawbone’s density by stimulating new bone growth using the implant post. This also allows the jawbone to fuse to the post, creating a secure foundation for the replacement tooth. As a result, it will closely look and feel like a natural tooth while allowing you to make a long-term investment in your smile. 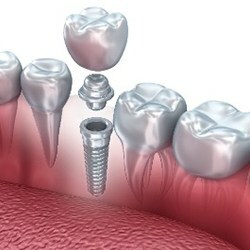 If you are looking for implant dentistry serving Cashion, you have come to the right place. Contact our office today to schedule your consultation for a complete smile.